All transactions are safe and secure with a reliable history in online purchasing behind each of our associates. 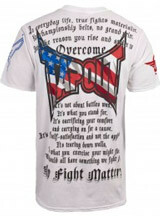 Buy the TapouT USA t-shirt to own UFC clothing and merchandise. The unique design on the front of this piece of Tapout clothing includes the Tapout logo with an American flag behind it. The flag is the perfect way to show off your patriotic side. The design on this Tapout t-shirt is surrounded by positive words encouraging others to face challenges head on. The Tapout logo combined with the flag's red, white and blue is a winning combination. The TapouT crew travels across the country in a tricked out tour bus in search of the next MMA superstar. Add this to your collection of Tapout clothes. In addition to the TapouT USA tee above, browse the UFC Clothing Gallery for more apparel like men's and women's clothes, kids shirts or hoodies.